The S.S. Badger is a 410-foot vessel, approximately one-and-one-half times the size of a football field, that is seven stories tall and can accommodate over 620 passengers and 180 automobiles, tour buses, RVs, motorcycles, and commercial trucks. 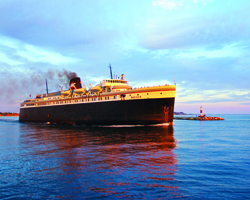 Each season, the S.S. Badger makes almost 500 crossings at 60 miles from port to port. Amenities include outside deck areas, deli-style snack bar, buffet-style dining area, upper deck lounge, aft end lounge, video arcade, children’s playroom, gift shop/ship’s store, private staterooms, free quiet room/museum, two free TV lounges, free movie lounge, and free parking at both terminals for passengers not taking vehicles on the ship. Note: Some map locations are approximate. Please call the venue at 231.845.5555 for exact directions.